Pleasure Ground is based on ideas around the decline of the rural Irish town. The notions of home, belonging, community, and change are themes Fregoli is always keen to explore, and it was with the winning of the inaugural Michael Diskin Bursary that these ideas became an actuality. The play began to take shape around the town of Boyle, Roscommon, inspired by its playground and recreational area called the Pleasure Grounds. A group of friends who have gone their separate ways meet back at their teenage haunt, the town park and playground, known as the Pleasure Ground. The town is dying, the Pleasure Ground’s glory has faded, and life has not quite matched up to youthful expectations. Over their night together, buried secrets become unearthed, past grievances boil over, and scores are settled. Jarlath Tivnan’s writing is witty and sharp, and captures the beauty of rural and small town life while also exploring sadness and isolation. His characters are very much of their generation (born in the 1990s ) but their stories will strike a chord with all. “It is set in a small town in the west of Ireland in the present day where a young man by the name of David has taken his own life.” Tivnan tells me after rehearsal. 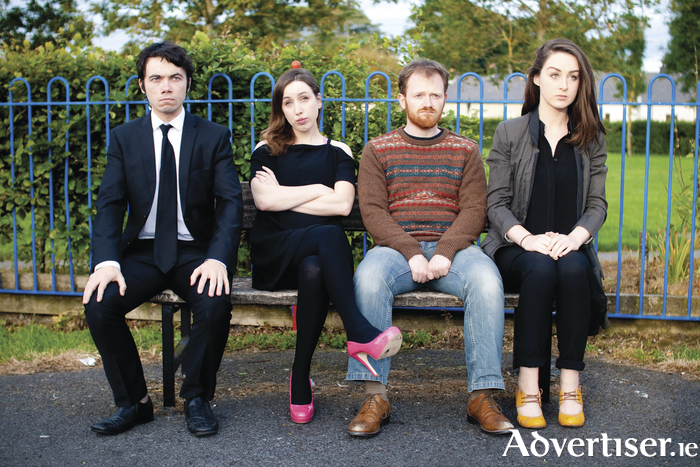 “The play concerns four charac, all of whom were David’s classmates in school; Evan, Lindsey, Brendan, and Aisling. They are all connected to David in different ways, some stronger than others, and we discover the connections as the play progresses. "The opening scene is the funeral and two of the characters have never left their hometown whereas the other two have left, gone to college, and travelled abroad so you have that dynamic when they come back. That is one of the things I was getting at in the play, the difference between the ones who left the town and those who stayed. It is also about how these young people react to one of their friends taking his own life, their confusion and fear, and the sadness and the anger as well that goes through young people today because we can’t pinpoint why suicide is so frequent, especially among young men and particularly in rural Irish towns. Tivnan is a gifted actor, most recently starring in the Galway International Arts Festival production of The Dead School. Pleasure Ground is "my first time writing a play by myself”.